PBI’s new steel line has a 30′ powder coating oven. Happy customers mean more business, and in 2006 Panel Built, Inc. experienced positive growing pains that required some big adjustments. To keep up with increasing demand, PBI purchased a second facility to increase its steel line productivity. The new, 20,000 SF facility was needed to accommodate the expansion of their steel and pre-assembled building lines. 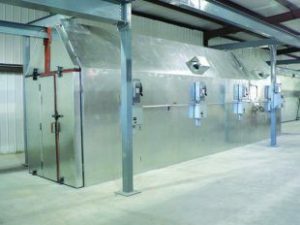 The facility houses a much larger powder coat paint line with a custom-engineered 30’ oven and a new gantry support system. The transition of the steel department into the new facility happened during the summer of 2006 and is now 100% operational. The new building enables PBI to purchase steel and building materials in bulk, decrease lead times and pass the savings on to their customers. Acquisition of the new facility was a direct result of increased sales in the mezzanine, stair system and steel accessory lines as well as pre-assembled buildings. The new building is located directly across the street from the original Panel Built facility, which still houses administration and support staff as well as the panel manufacturing line.